Gromwell Grey Calendula Love Mugwort Mint Captain Artemisia Hinoki Pinocchio Bitter Melody Seven White Fox Seaweed Mermaid Charcoal Prince Pink Green Stripe Pearl Queen Ginger Meow Hair Soap Bonbons Hair Soap Pure Molly Citrus Bear Cheer Calmer Honey Dear Barley Bali Others: Unsure which to pick? 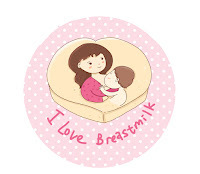 ♥Baby Snow Breast Milk Lotion ♥Baby Mint Breast Milk Lotion ♥Baby Coral Breast Milk Lotion ♥Baby Rosy Breast Milk Lotion ♥No addictive or Pure Breast Milk Lotion Others: Unsure which to pick? To mother, it is also a great way to turn leftover or expired mother's milk into something the babies can derive benefit from. This is a PROMOTION of custom made order of about 1 KG of Mother's milk soap and 1 batch of Mother's milk lotion using mother's milk supplied by you. Each custom made soap and lotion is made individually with your selection of soap type from the listing. Please pick 1 type for soap and also 1 type for lotion. Custom orders are priced at RM300 (N.P. RM310). 1 batch consist of 10pcs of soaps and 1 batch of lotion (5 bottles), total of them required 480~600 ml (18oz or 20oz). The ♥ Mǔrǔ Collection ♥ listing has been formulated to suit most skin types and feedback from our existing customers. To ensure it suits you patch test first, discontinue if irritation develops. Unscented, olive oil-based, mild, non-irritating, suitable for elderly and kids. Removes impurities while providing extra protection layer to skin. Olive oil-based, mild, non-irritating, gently remove impurities, excess oil and makeup while giving the skin a soft and supple feel. Protect, heal and provide anti-aging benefits. For sensitive & rashes skin. Can fight the effects of skin diseases such as psoriasis and the effects of natural glycerine on skin are a healthier, more natural-looking appearance. Scented with lavender, olive oil-based, mild, decrease inflammation, softening and soothing benefits. Helps in tissue repair, protects from environmental stress. Effective in fighting dull, flaky dryness as they contain polysaccharides, which become gelatinous in water. They form a fine protective film when applied on skin. Mild for baby and toddlers. Lighten skin, anti-inflammatory and antibacterial compounds help to decrease the appearances of scars and increase healing and tissue regeneration. Stimulate hair growth and prevent baldness. Keep hair to stay healthy and strong. * Good to use during Poo-Free or Go No Poo transitional period. You may also want to condition your hair after using the soap, as sometimes it can leave your hair a bit dry. There are lots of different methods; I use apple cider vinegar or olive oil to keep my hair moist. To treat dandruff, dry scalp, flaky scalp, acne on scalp and other infections that contribute to hair fall. * Good to use during Poo-Free or Go No Poo transitional period. You may also want to condition your hair after using the soap, as sometimes it can leave your hair a bit dry. There are lots of different methods; I use apple cider vinegar or olive oil to keep my hair moist. Help heals skin lesions, insect bites, eliminate negative ions, bruises and act as insect or bug repellent. Mugwort and Artemisia can remove negative energy and also believed to help attract good fortune and prosperity! Hinoki wood good for people with allergy, eczema, psoriasis and antioxidant properties. Effectiveness of Hinoki to reduce stress and treating skin problems, such as minor skin irritations, rashes, cuts and abrasions. Ease eczema itch, keeps the skin glowing & helps in toxic elimination from the body. Antioxidant properties of bitter gourd helps in the reduction of oil production, and also keeps the skin fresh and smooth. Mild eczema, balance T-zone and reduce oily skin, prevent blemishes and acne. Mugwort and Artemisia can remove negative energy and also believed to help attract good fortune and prosperity! Antioxidant and improving the skin tone. Finely grinded oat texture and smoothing out blotchy areas. Proven to reduce inflammation and create a barrier to protect the skin from outside pollutants. Healing and anti- aging properties. Seaweed Mermaid Anti-inflammatory. Make your skin suppler, elastic and can help stop cellulite in its tracks. Others: Unsure which to pick? 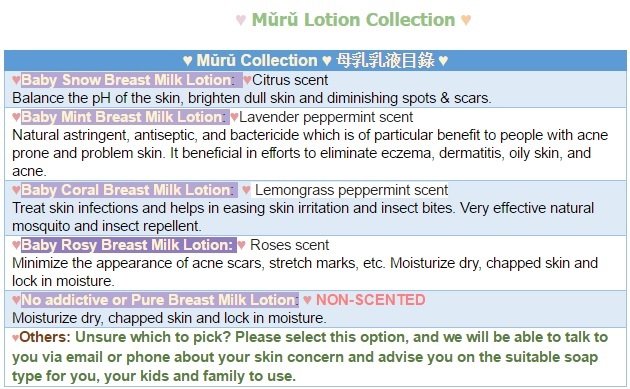 Please select this option, and we will be able to talk to you via email or phone about your skin concern and advise you on the suitable soap type for you, your kids and family to use.